A private spaceship designed to carry space tourists made its first rocket-powered test flight today (April 29), reaching supersonic speeds as it paved the way toward commercial flights in the near future. Virgin Galactic's SpaceShipTwo space plane fired its rocket engines for the first time during flight this morning in a test from California's Mojave Air and Spaceport. The vehicle was carried aloft by the mothership WhiteKnightTwo, and then released in midair at an altitude of about 46,000 feet (14,000 meters). 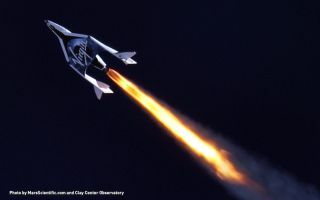 At that point, SpaceShipTwo test fired its rocket engine, designed to propel the craft the rest of the way up to space. Virgin Galactic is backed by British billionaire Sir Richard Branson, who was on the ground at Mojave to view the flight today. "This is a momentous day and the single most important flight test to date for our Virgin Galactic program," Branson wrote in a blog post on Virgin's website. "What a feeling to be on the ground with all the team in Mojave to witness the occasion." If test flights continue to go well, SpaceShipTwo may carry passengers as soon as this year or 2014, Virgin Galactic officials have said. Already, more than 500 people have signed up for the flights, which will be run out of Spaceport America in New Mexico once testing is complete. For the first time ever, oxidizer flows through SpaceShipTwo’s rocket nozzle in flight, successfully demonstrating key components of the system. The April 12, 2013 test flight was a key milestone in advance of SpaceShipTwo’s first rocket powered flight. The test flight began this morning at 7 a.m. PDT (10 a.m. EDT, or 1400 GMT). Flying aboard SpaceShipTwo were pilot Mark Stucky and co-pilot Mike Alsbury, both test pilots for the private aerospace firm Scaled Composites, which built SpaceShipTwo for Virgin Galactic. It comes after two recent glide test flights, on April 3 and April 12, that set the stage for today's landmark powered test. Scaled also built the space plane's predecessor, SpaceShipOne, which won the $10 million Ansari X Prize in 2004 by becoming the first commercial vehicle to fly people to space and back twice in a week. Follow Clara Moskowitz on Twitter and Google+. Follow us @Spacedotcom, Facebook and Google+. Original article on .